MSPs field all kinds of requests for a range of cloud services from their clients and new clients alike. Those that specialize and find their niche can be much more successful than those who try to be all things to all people. AWS, Digital Ocean, GCE and other mega-cloud providers have spent years building up infrastructure that offers point-and-click access to compute or storage services for all levels of consumer. However, they don’t have a consultative approach to providing solutions. This is where competitive – and most importantly, competent – MSPs can shine! By understanding the needs of specific business types and catering to them, a regional MSP can win customers and thrive. In this article, we’ll look at what it takes to be a consulting MSP, which challenges must be overcome, and how a cloud management platform can help. For most MSPs, trying to be all things to all customers is becoming obsolete. It’s better to serve a specific market niche. Certainly, there are plenty of niches to be claimed: offering an “IT department on demand” service for small and medium-sized businesses; focusing on managed hosting for banks and financial services firms, healthcare organizations, or oil and gas; or specializing in specific applications or professional services. These are all valid niches. Understanding the compute needs of a chosen niche is the key to a consultative relationship. Rather than simply providing servers and storage, the MSP should sit down with the customer and plan out resource needs through busy and slack times. For example, if we look at banks and think about how they’re going to be using their capacity, every night a bit of FinTech software needs to do a lot of processing – so compute resources should be increased during overnight hours. If we look at healthcare, the winter months have higher capacity requirements due to higher incidents of illness, meaning more patient records need accessing. E-commerce businesses get much busier around Black Friday, Cyber Monday, Boxing Day, and other big sales days, and they need higher capacity to handle huge spikes in traffic. By anticipating these service requirements and provisioning for them automatically, an MSP can keep customers very happy. In order to do that, MSPs need the ability to provide compute and storage resources on demand. They shouldn’t force their customers to request a different level of service and sign a new contract. Rather, they should enable flexible, customer-driven provisioning (by the customer) with contract language that specifies a standard level of service and a “burst” level of service for a specific added charge. How can MSPs provide this? There are several key challenges. Simplifying management – it’s difficult to enable customer-driven provisioning without an orchestration layer or a cloud management solution in place. Without such a solution in place, the process becomes quite manual – the IT managers must physically check on available resources in various places throughout the data center, and that takes time, much like a physical stock check in a supermarket. But, if the MSP is using a cloud management platform, it can provide a service where the customer can see what’s available in terms of compute resources and consume more themselves. Avoiding over-provisioning – an MSP that wants to be ready for anything has to maintain a large supply of idle resources that can be turned into capacity as customers need it. This requires a large up-front investment. To avoid over-provisioning, the MSP needs to sit down and consult with its customers to create an action plan for capacity scaling on demand, and making sure that infrastructure is in place for customers’ future needs. A cloud management platform helps by revealing exactly how much compute, storage and networking power is available at any given time. Moving away from fixed contracts – rather than having a fixed contract for a standard level of services, the MSP should be flexible and offer resource bursting. The customers pay for a minimum commitment of resources and have an overage charge for bursting capacity. This gives them the freedom to expand quickly without going back to the MSP, and gives the MSP the security of extra resources being measured and chargeable. What infrastructure attributes make it possible to rapidly and cost-effectively become a consultative MSP? There are several key requirements. To deliver the responsiveness and flexibility that keeps customers happy, MSPs need a centralized management infrastructure that allows resource planning and allocation through a unified interface. Rather than having different systems tracking for compute or storage or network supply, the management tool could allow central control over the entire infrastructure. This is essential for understanding and assigning resources. With flexible, automated resource management, the MSP can rapidly adapt to its customers’ unique needs. That might mean enabling deployments in multiple locations across a region, or flexibility when it comes to contracts and billing. For example, the infrastructure management platform could handle scaling automatically – it could watch to see that if a customer’s usage reaches, let’s say, 90 percent of capacity for a certain period of time and automatically provision more resources. When the customer’s usage drops below, say, 30 percent, excess capacity is removed. The MSP saves time and money by not having to manually adjust resources, and the customer wins because they only pay for what’s being used at any given time. Multi-hypervisor support is also essential. The MSP should help the customer place each workload with the right technology. With a cloud management platform that supports multiple hypervisors, an MSP doesn’t have to be all KVM or VMware anymore; it can use the best tool at the right cost for the job. For a consultative provider, having a cloud management platform delivers the agility needed to respond quickly to customer requests along with the automation needed to control staff expenditures. There are several specific benefits to be gained. Provisioning efficiency: Cloud provisioning is software-driven; it requires minimal amounts of staff to perform the operation. Rather than racking new servers as customer needs change, an MSP can carve out new resources from existing infrastructure and provision them on the fly. To offer services, MSPs need a cloud platform with the ability to orchestrate across a range of hypervisors – and to achieve peak efficiency, they also need to be able to manage these centrally. 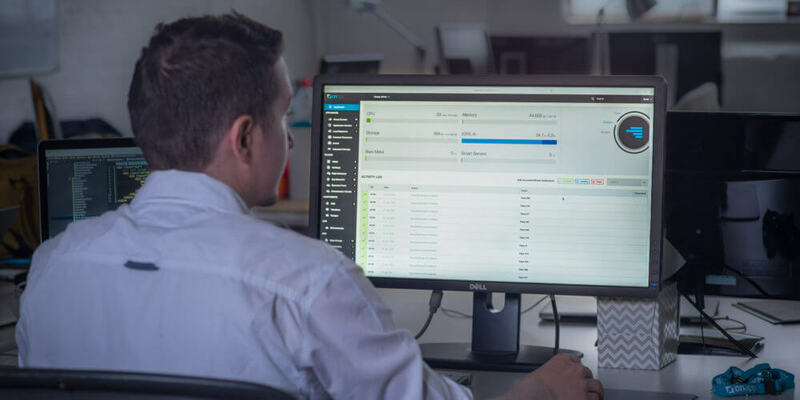 By being able to see all physical servers, firewalls, storage and virtual servers in one place, it’s easier to react to customer needs and issues as they arise. Administration efficiency: A cloud management platform should minimize manual effort at every point in the customer lifecycle. With the right platform, properly-trained personnel, and some consulting from the chosen vendor, technicians should be able to provision a new customer in hours rather than weeks. Vital to this is the need to be able to create permission-based user roles and user groups so that, once the service is in production, clients can self-serve resources within a secure framework – access control gives the customer only what they should be able to access. The cloud management platform should also leverage customer needs and profile these into ‘templates.’ Once a template is created for one style of deployment, it can be easily modified to onboard a second customer with similar needs, and so on. Having a central template repository makes provisioning easier and faster for administrators and also reduces provisioning errors. Billing efficiency: Leveraging a solution that also intricately calculates resources for billing by customer is another element that will save hours of manual work, and improve margins quickly. Getting this right is crucial for rapid growth. Resource efficiency: With the ability to treat the entire compute, network, and storage infrastructure as a flexible pool of resources, MSPs can easily assign specific resources to specific clients and bill for them accordingly, eliminating custom racking and stacking for individual clients. What’s more, the MSP can replicate one customer’s setup for the next customer, and simply tweak the resource allocations or service mix to suit the new customer. MSPs can thrive if they offer a consultative service to customers, specialize in a particular market, and enable customers to quickly and cost-effectively meet their service needs. A cloud management platform simplifies resource provisioning, billing, and infrastructure management so MSPs can successfully serve their customers without breaking the bank. Bio: Caroline Paine is director of MSP sales at OnApp. She brings together solutions to overcome the challenges that MSPs, telcos and other service providers face. She joined OnApp as a start-up in 2010, and has since helped thousands of MSPs, telcos and datacenter operators create new revenue opportunities, and stay profitable and competitive in a fast-changing market.